I have learned a lot about cancer over the past year, but I am also aware there is much I do not know. I certainly do not intend to try telling you all I have learned, because if you wish to know more about cancer, I recommend you read some of the books I have reviewed, and/or visit some of the internet sites I have provided links to. So, this page just contains some of the basic facts I have learned about cancer which I thought might be of interest whether you have cancer or not. For believe me, taking steps to prevent cancer is far better than trying to fight it once you have it. How do we get cancer? * Every cell in our body is constantly being renewed - either hourly, daily, weekly or monthly. * This process frequently goes wrong, and when it does, faulty cells are produced. * Our bodies are normally able to identify faulty cells and destroy them immediately. * If a faulty cell does start to grow, our immune system normally attacks it. * These cells are called 'pre-cancerous cells. * Postmortems show the same level of pre-cancerous cells worldwide. * People who are born and live in some countries, hardly ever have cancer. * When people from these countries migrate, they acquire the host countries cancer levels. * This indicates that the biggest cause of cancer is our environment and lifestyle. What's the difference between cancer cells and healthy cells? * Cancer cells use blood sugar as an energy source and grow by a process of fermentation. * Preventing an excess of blood sugar inhibits cancer cell growth. * Healthy cells grow through burning oxygen. * Cancer doesn't like highly oxygenated blood. * Raising the blood oxygen level inhibits cancer cell growth and aids normal cell growth. * Cancer likes an acidic environment (blood supply). * Cancer produces large quantities of lactic acid as a by-product of fermentation. * The liver converts the lactic acid back into glucose (blood sugar). What's the difference between conventional treatments for cancer, and an anti-cancer diet? * All conventional treatments cause mental distress and physical trauma to the body. * Eating an anti-cancer diet might cause you to buy more toilet rolls. * Surgery can only remove the primary tumour. * An anti-cancer diet works on the whole body. * Radiation and chemotherapy, destroy healthy cells and lower the immune system. 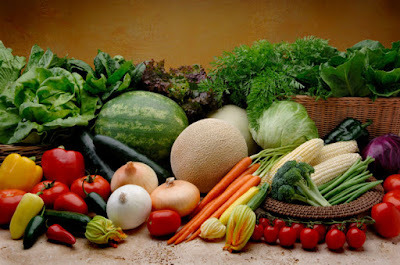 * An anti-cancer diet only attacks cancer cells, and improves the immune system. 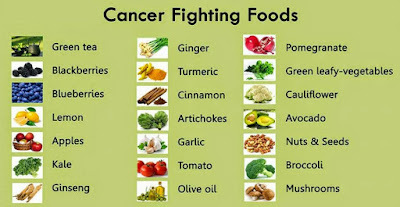 * An anti-cancer diet helps protect healthy cells from attack by cancer. * An anti-cancer diet doesn't need expensive drugs. * An anti-cancer diet doesn't make any money for the pharmaceutical companies. * The NHS won't tell you anything about using an anti-cancer diet. * An anti-cancer diet can minimise the side-effects of, and enhance conventional treatment. * An anti-cancer diet can provide protection for the rest of your life. * Billions of pounds are spent on cancer research and conventional treatments of cancer. for most cancers, is only marginally better now than it was 50 years ago. Antibiotics destroy normal protective gut bacteria, allowing yeast and fungi to grow. UK water is chlorinated. When showering in very hot water, chlorine vaporises into chloroform, is inhaled and goes into the blood stream. Chloroform is highly carcinogenic. (It is possible to fit a shower filter to de-chlorinate the water used for showering.) France uses ozonated water. (This could be behind the myth that the reason the French have a lower incidence of cancer, is due to them drinking a lot of red wine). Avastin is an anti-angiogenic drug for fighting cancer. It blocks formation of new blood vessels feeding cancerous cells. (It uses a'metronomic' approach - slow but continuous attack). Eating plenty of foods containing a wide range of phytochemicals does much the same thing. Genistein, an isoflavone phytonutrient derived from soybeans, is a natural form of Tamoxifen. There is some debate as to whether it is necessary, or even beneficial, to take food supplements when following a very healthy diet, such as the one I am on. Certainly, if you are undergoing any other treatment for your cancer, or taking any other medication, you should consult your consultant or doctor prior to using any food supplements. My Approach to Food Supplements - And Everything Else! , if I read about something that could possibly help, I added it to the arsenal of ammunition to use against my cancer. As you will see from the list, this has resulted in me taking rather a lot of tablets and pills. In fact, taking them accounts for at least half the amount of liquid I drink each day. The link shown below takes you to a table that contains details of the food supplements I have been taking. This list is provided for information only and I would strongly advise that you consult a qualified nutritionist prior to taking food supplements. , was that many ordinary foods contain chemical ingredients called 'phytochemicals'. Phytochemicals are non-nutritional plant chemicals that have protective or disease preventive properties. They are responsible for giving food its colour, taste and smell and therefore the more colour, taste and smell a food has, the higher concentration of phytochemicals it contains. There are already thousands of known phytochemicals, and more are being discovered all the time. A single fruit or vegetable may contain over one hundred different phytochemicals. It is well-known that plants produce phytochemicals to protect themselves from pests and disease, but recent research demonstrates that these chemicals can also protect humans against diseases, including cancer. Phytochemicals work in several ways. Some interfere with the enzymes that are involved in enabling cancer cells to grow. Others protect healthy cells from attack. In order to obtain the maximum benefit, it is necessary to consume as wide a range of different coloured foods as possible. This is often referred to as a 'rainbow diet' or 'mediterranean diet'. I learned that cancer cells are extremely difficult to kill directly, but by cutting out the foods, particularly sugar, that cancer needs in order to grow and spread, and eating plenty of foods containing a range of phytochemicals, I could fight my cancer with food, in much the same way that chemotherapy does. By starving it to death! What's Good to Eat, and What's Not? As I began to read more about how it was possible to fight cancer with food, I soon became aware that it was not as simple as just 'good foods' and 'bad foods'. 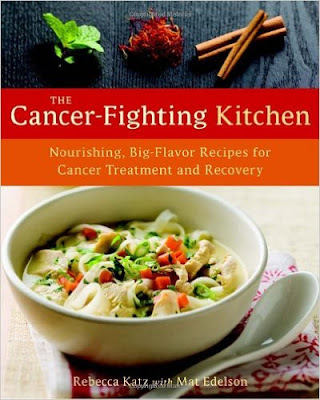 I learned that some foods had a much greater potential for fighting cancer than others. I found that whilst some foods were alright to eat in moderation, others were best avoided altogether.